What is a Hot Air Balloon? “A Hot Air Balloon is an aerostat in which the lifting force consists of hot air produced by means of a propane burner”. The Hot Air Balloon is remarkably simple in its conception and handling. 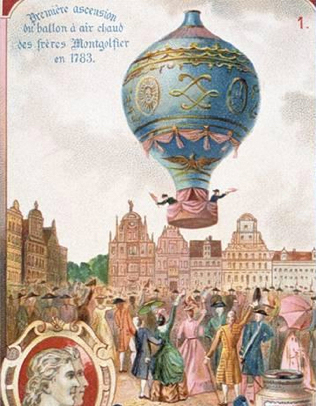 The first hot air balloon was flown in 1783 in Paris using the materials available of the day. It consisted of a large bag to enclose the heat generated from a fire on the ground with a gondola attached to carry the people. 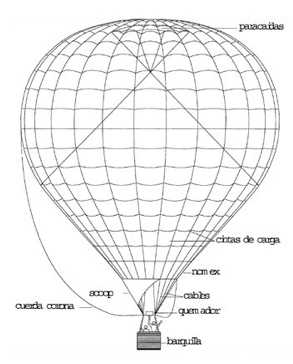 The modern Hot Air Balloon consists of three main parts: Envelope (The large bag), fuel system (burner with load frame and fuel cylinders) and finally a basket of woven construction to carry the pilot and passengers. Envelopes are now made of high resistance polyamide fabric able to withstand high temperatures reinforced by polyester load tapes. These tapes carry the forces due to loading and transmit the forces to the load frame via stainless steel wires. The burner is a high output device for converting the fuel (liquid propane) stored in the fuel cylinders into heat energy. The baskets are specially designed and manufactured to withstand repeated landings and provide a natural protective environment. Warm air rises. Most people know this and a Hot Air Balloon rises because it has warm air trapped inside the envelope. This warm air is hotter than the air outside the envelope and it is therefore less dense. This means that the air inside the balloon is lighter that that on the outside. If we have enough of this lighter air generated inside the envelope then the balloon will continue to rise. It will fly! The bigger the balloon the more hot air it can contain, the greater the lift and the greater the number of people it can carry. However the air inside the balloon is continually cooling which is why it needs to be topped up all of the time. This is why a constant source of heat is required in the form of a propane burner to maintain flight. If burning is stopped the balloon will no longer continue to rise as the temperature inside the balloon and outside become similar. For a short period of time the balloon will be in a state of balance or equilibrium. After this, with no more heat applied the balloon will gently descend. Apply heat and it will go up! Stop burning and it will go down! The top of the envelope has a large hole, which is sealed with a fabric valve. This is kept in place by the pressure inside the balloon. This fabric valve looks similar to a parachute and consequently is called a parachute valve! The pilot is able to let hot air out of the balloon by controlling this valve with a rope when he wants to come down quickly or to land. This valve automatically reseals when the rope is released. Can you steer a Ballon? No, not in the true sense. A balloon travels freely with the wind. However wind directions vary at different altitudes. By finding these different winds by going up and down, it is possible for experienced pilots to use them to manoeuvre the balloon with quite a degree of skill. Hot Air Balloons operate best and safely when atmospheric air conditions are dry and stable with light winds. Early in the morning and early evening tend to provide the best conditions most of the year as during the middle of the day the heat of the sun generates thermals which make the balloon very difficult to control. You can often see examples of thermals when you see large puffy clouds building up in height in the sky. Balloons are also happier flying in lighter winds and so are the passengers. Winds are also generally lighter in the mornings and evenings. Both of these reasons explain why you rarely see a balloon flying in the middle of the day. However in cold winter climates when the weather is fine and stable it is very often possible to fly for most of the day due to the lack of thermic activity. It is generally recognised that people flying in a balloon are in no greater danger than those following in the chase vehicle. Hot Air Balloon flying is one of the safest forms of aviation. Similar controls and regulations that apply to aircraft and airlines apply also to hot air balloons. Parachutes are not required by the people in the basket the same as they are not required in a passenger airliner. Ballooning is an adventure sport not a danger sport. A balloon is a very simple uncomplicated craft with very little to go wrong. All of the major items have a safety back up in case of failure. Ultramagic led by a team of experienced aeronautical engineers has the highest levels of approvals from the world’s aviation authorities. The equipment goes through rigorous testing during manufacture. It is then regularly inspected by an independent aviation inspector as well as receiving a pre-flight inspection by the pilot before each and every flight. Balloon pilots go through a very thorough training and examination process and as part of this training they are taught that if the weather is not quite suitable for a balloon flight then the flight will not take place. Safety first is the most important part of the wonderful experience of Hot Air Ballooning. How do I get started in ballooning? There are many ways to become involved in Hot Air Ballooning. Ballooning is recognised very much as a team sport. One can train to become a pilot or many people are happy to just become part of the balloon crew. This can be just as enjoyable as the involvement is just as great and one still experiences the flying process as well as being part of the whole process from start to finish. An average size sport balloon usually requires four people to operate. When the balloon is inflated on the ground, the pilot operates the burner from the basket whilst two people hold the balloon open at the bottom or mouth as it is called. They also control the ground inflation fan. Another crew person then restrains the balloon during the inflation process by holding a rope that is attached to the top of the balloon. One or two of the crew may then fly with the pilot whilst the remainder carefully use their skills to chase after the balloon in the chase vehicle. As you can imagine, ballooning can also have an active social side to it similar to many team sports. Crews become friends and very often travel to different parts of the country or even to different countries to operate their balloon. Is it difficult to become a pilot? No! For those people who are really keen and determined, it is possible to become a balloon pilot in a very short period of time. Regulations on pilot training vary slightly depending on the aviation authority responsible in each country. Please contact your Ultramagic dealer or Ultramagic customer support for exact requirements for your country. However each training program does requires a certain number of flights with an approved person as well as studying for written examinations. A practical flight test and solo flight must then be taken. This should not be seen as daunting as the whole experience is very straightforward whilst being fun as well. It can take any where from two to twelve months to gain your private pilots licence for balloons depending on how much time you can apply to the training, the availability of crew to help and of course having suitable weather conditions during the training period. Additional regulations may apply to licence requirements for flying fare-paying passengers or for flying commercially once you have gained your licence. Your Ultramagic Dealer or Ultramagic Training School ATO (ato@ultramagic.com) will be happy to provide further information on this as well as details and costs of instructors and training schools. The cost of the balloon depends very much on the size and specification that you choose. It is possible to purchase a small sport balloon for around 18,000 Euros, which would give many years of active service, fun and adventure. It is also possible to spend much more should you so wish. The range of sizes and types of balloons is diverse to meet every pilot’s particular requirements. A trailer is then required to transport and store the balloon equipment in. Fuel costs used for an hour’s flight can work out as little as that of the cost of a round of drinks. However one carries a reserve of fuel allowing one to fly more than one hour. In most countries you require insurance for the balloon and its passengers, however because of the excellent safety record of ballooning this is a lot less than insuring a sports car. As you pay an annual premium, the more you choose to fly the less the cost per flight will be. Can the costs be shared? Yes. Balloon ownership is ideally suited to club or syndicate ownership similar to sailing, and as it requires a small team to operate a balloon, a group of friends or workmates all with the same interest can be the ideal basis for the syndicate. This way the costs for the individual are reduced dramatically. You certainly do not have to be a millionaire to fly a hot air balloon. Costs can also be shared by gaining sponsorship for your balloon. By putting the name of a local or national company on the side of your balloon, they can gain a tremendous source of advertising whilst you have your costs greatly reduced. This can be a very practical way of operating a balloon.